Stocks show broad strength - is a breakout in store? In last week's post we saw stocks were weakening but we said "don't throw in the towel yet". This week we reaped the rewards of holding steady. As can be seen, we plot six different indicators. After this past week's market action we now have all of them moving in a direction that indicates continued strength in the market. Markets did well this past week and it is clearly reflected in the moving averages. The number of stocks trading above their 20-day moving average rose sharply, increasing by almost 800. Similarly, the number of stocks trading above their 50-day moving average also rose, increasing by almost 600. We see a continued increase in the number of stocks whose 20-day moving average is above their 50-day moving average. This bullish indicator has continued climbing steadily for 8 weeks now. All told, between 4000 and 5000 stocks out of about 7200 are trading above important moving averages. There may be some flavor of being over-bought in these numbers but it is undeniable that stocks are exhibiting broad-based strength. Last week we saw some mixed signals from Aroon and Chaikin Money Flow analysis. This week we see consistency across both types of indicators. The Aroon analysis shows stocks in strong up-trends or down-trends. The chart shows the number of stocks found to be in strong up-trends has increased slightly. The better news, however, is that the number of stocks determined to be in a strong down-trend has decreased, dropping by almost 400. We also plot the results of Chaikin Money Flow analysis. The number of stocks undergoing strong accumulation or buying has increased from about 1000 last week to about 1100 this week. Not shown on the chart is the number of stocks shown to be undergoing strong distribution or selling. This indicator decreased again last week, with the number of stocks in this category going from 480 down to 440. In the chart below we see that the SPDR S&P 500 ETF (SPY) has continued to make good steady progress. 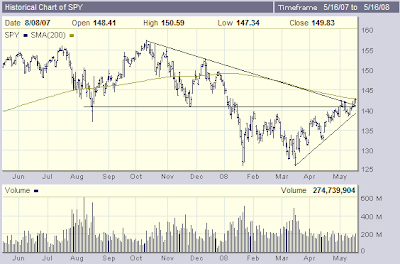 As we usually do, we will use SPY as a proxy for the market in general. We can see on the chart that SPY has held above the downward sloping trend line, the upward sloping trend line and the horizontal support line. SPY almost touched its 200-day moving average during Friday's trade. SPY has a relatively strong DMI reading. Indeed, 182 of the stocks in the S&P 500 are registering up-trends with decent strength according to our DMI analysis. In terms of Aroon, fully 306 stocks in the S&P 500 are exhibiting strong up-trends. Unsurprisingly, SPY itself is also showing a strong up-trend according to Aroon. The number of stocks in the S&P 500 whose 20-day moving average is above their 50-day moving average now numbers 358 or almost 72%. SPY also has its 20-day moving average above its 50-day moving average. Indeed, the ETF is pretty much following its 20-day moving average upwards. Many financial bloggers have been complaining that recent rally attempts have not been accompanied by adequate volume. The chart shows that recent up volume has not been as strong as the down volume we saw at the January and March lows. Nevertheless, the analysis presented above demonstrates that a large majority of stocks are participating in this recent up trend. Granted, volume is not through the roof. Still, the broad-based nature of the current advance, the confluence of indicators and fairly decent volume all provide a degree of confidence that this rally has further to go. Having said that, we all know that stocks do not going up in a straight line. I have discussed in a previous post that a new trading range could be in the making and I have admitted in this post that stocks could be over-bought. Regardless of these caveats, everything we have discussed in this post seems to point to continued strength. For those who watch charts, it can be seen that each of the major averages is currently closing in on its 200-day moving average. If the strength I am detecting continues, we will be seeing each of them break through this important level in the very near future. I would expect that would bring a lot of more buying into the market and maybe even power the averages into positive territory for the first time this year.